Unsurpassed in quality and form, Grand Design RV has continually raised the bar since breaking into the industry in 2011. With an innovative approach to the design process, and an clear and open pathway of communication with customers, Grand Design RV’s lineup is a leader in the market. But with offerings like the spacious and luxurious Grand Design Solitude Fifth Wheel, is it at all a surprise? Always an impressive lineup to showcase, the Grand Design RV Solitude features the timeless touches that will only get better with age. Well-appointed and decked out in a range of tasteful decors, the Grand Design RV Solitude fifth wheel offers extended-stay comfort in an elegant package. 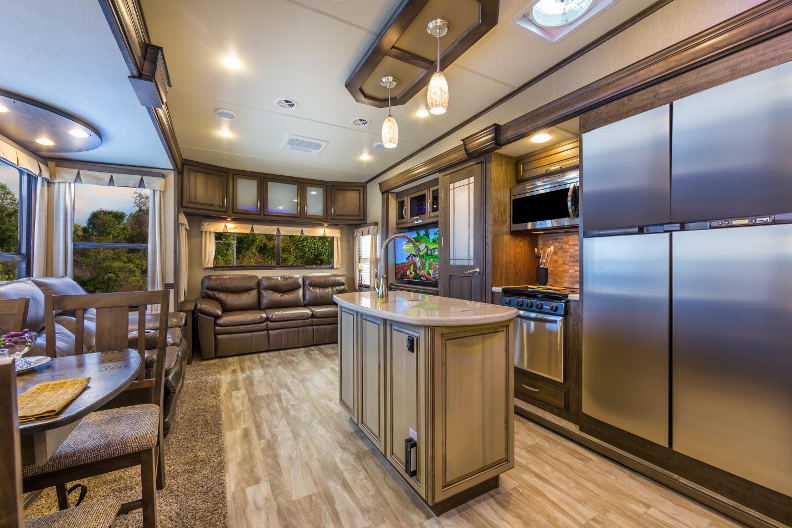 Furnished with residential appointments like a plush, bonded leather sofa, optional swivel recliners, and durable Congoleum flooring that carries a 7-year warranty, the interior space of the Grand Design RV Solitude is a retreat unlike any other. Built on heavy-duty 7,000 pound axles and constructed with a drop frame chassis and five-side aluminum side cage construction, the Grand Design RV Solitude offers the durability to give you peace of mind on any journey. 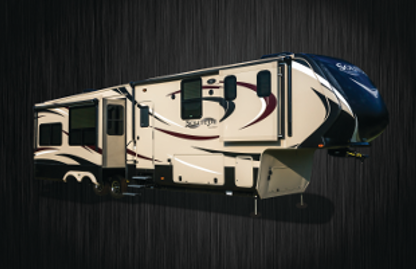 And with added touches like rust resistant aluminum tread lite entry steps, dual pane windows, and exterior security lights, you can rest easy knowing you’ve chosen a fifth wheel that’s been built with the careful considerations to make the difference on the long haul. Although, if it’s sleeping easy you want (and who doesn’t! ), then the Grand Design Solitude Fifth Wheel won’t disappoint. Sweet dreams await you in the refined master bedroom. Elegantly decorated with a residential-style headboard and pillow top mattress, the master bedroom practically guarantees a perfect night’s rest. Of course, the luxury of the Grand Design RV Solitude is something to be seen in person to be truly appreciated. Visit our Duluth, MN location to discover all this fantastic lineup has to offer you!